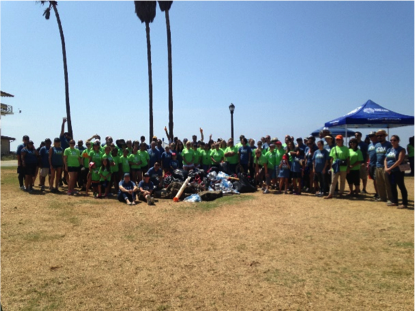 This beach cleanup was a real eye opener, the amount of trash me collected was insane. People were filling up 2-3 trash bags each, filled with cans, bottles, food trash, and even clothes. Trash was stuck in the mud in the runoff channel that leads to the beach. On the beach, you would find a cigarette bud every time you looked down, even though you aren’t allowed to smoke at this state park. Even right around the trash cans you would find a ton of trash, it’s like people can’t even put it in the trash they are so lazy. People don’t realize how much the one little piece of trash effects the environment because if everyone left a piece of trash and no one was there to pick it up, the world would be covered in trash and everything would be dirty and not have the beauty it does today. Thanks to the programs and companies that support these events it gives the community a chance to really give back to the environment. Next time you go to the beach and think about leaving trash on the beach, ask yourself if you want to swim in water full of trash and glass bottles. This event was a great experience and the amount of families and devoted people that came to help was amazing. - By Mason Howard, 11th Grade ECO-Warrior.